Where were you when you you were told that your child had a medical diagnosis? Like many major events in the world and in our own lives, that point in time is often embedded in our mind as if preserved in Amber. The diagnosis will have changed your lives and expectations, but if your child has a well-known condition, you are more likely to now have the key to unlock the door to support, information and treatment pathways. That’s not to say that the that the path ahead is always clear, particularly when it comes to finding education solutions. However, when your child has a condition that is rare or when a diagnosis never arrives, you're more likely to be thrust into a desert landscape of few proven treatments or well-established support networks. We have been through the diagnosis journey three times with Son 2, twice with Son1 and twice for me. Six have been for rare conditions: Reflex Anoxic Seizures (Son2) Ehlers Danlos syndrome/PoTS (all three of us) and Punctate Inner Choroidopathy (Me). My husband also has his own rare condition, Poland syndrome. We're a rare family! When Son2, aged six, was diagnosed with all-too-common, Asperger’s syndrome, a diagnosis led me to the National Autistic Society and its Early Bird Plus program. Although autism then, as now, still has huge gaps in knowledge and provision, at least most people had heard of it. But before this, when he was diagnosed with Reflex Anoxic seizures at just 13 months and later, when he was diagnosed with PoTS and Ehlers Danlos syndrome aged 13, the landscape was very different. There was very little in the way of information. Both times small patient-founded groups, STaRS and Ehlers Danlos UK came to the rescue. In fact, for EDS, diagnosis only came about because I stumbled upon the story of a young woman with similar symptoms on the Genetic Alliance UK Website. As a journalist, I knew how to research as much as I could about EDS before I consulted my GP. This was just as well because she'd never heard of it and was happy to refer us to the consultant I'd been guided to by EDS UK. But for many others, it's a long road with diagnosis for any rare disease averaging seven years after symptoms begin. 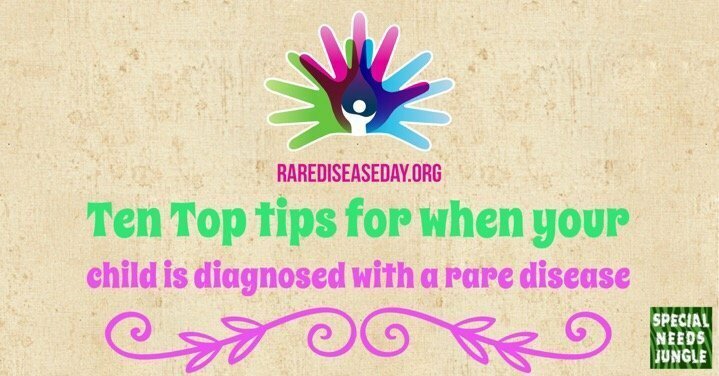 If you’ve recently found yourself being thrust into a world of rare disease diagnosis or none at all, as it's Rare Disease Day, I'm sharing some of the things I've learned on our journey. Put blame aside. It’s easy to blame yourself for your child's condition, if it is genetically based, or if you wonder if you have done something differently. However, there is no point whatsoever in doing this unless you enjoy feeling bad. Feeling bad leaks energy that you need to help find solutions for your child. Therefore, by punishing yourself you wind up punishing your child. Blame=Drain. Be prepared for questions: If you get sick of explaining your child's condition to others people, why not type out a short, numbered fact sheet about the condition and specifically, how it affects your family. At the end you can include a section called, 'How can you help? Include practical things such as lifts to hospital, help with shopping or picking up prescriptions, help with picking up children from school. Also make one for your child's school tailoring the help section at the end to include information such as how your child can be helped during the school day, at lunchtime, playtime, and any anything that they may need help with. Something like this may also be handy to give to your GP if they are not very familiar with the child's condition. The G in GP stands for general and they deal with many different conditions, so it may be very welcome. Find education support. Depending on where you live, your child may have an Education, Health and Care plan, a statement or another type of statutory support. If your child doesn't qualify for this level of educational help then ensure the school draws up an Individual Health Care plan that complies with any guidance on children at school with medical conditions. Research, research, research. Finding resources and information to make your lives easier has been key for many families. As well as local help, there are also a growing number of open access Journals including Orphanet Journal of Rare Diseases. Google Scholar can also throw up articles of interest. You might not find your child's condition, but you might find the name of someone with an interest in the area. Become an expert patient advocate for your child. You know your child the best and no one else has their best interests at heart more than you do. Use the research you've done and information you've gleaned from other patients or carers to make sure that your child gets the help they need. When the condition isn't very well know you might experience some resistance from medical professionals who know less about the condition that you do, but won't accept that. We have experienced this with some medics who may have heard of EDS in passing, but certainly do not know what you know. Be respectful but be calm and resolute. This is far easier said than done, because when you're trying to help a child who in pain or otherwise unwell, it's a very difficult and emotional thing to go through as a parent. Be imaginative. People in helping professions sometimes do things a certain way because that's the way they've always done it. But now, with the advent of innovations such as personal health budgets (UK: still at an early stage) you may be able to fund solutions in a way that doesn't fit "standard care". An example is for my boys' PBs. Although part of an EHCP in this instance, I knew that the best preventative treatment for Ehlers Danlos is gentle exercise. So, I found a physio to oversee a dedicated gentle exercise program that is now funded as part of their plans. Be kind to yourself. Your child relies on you, as well as any other children you may have. You may have a partner to share the load, but still, not taking care of yourself is going to lead to you not being able to take care of anyone else either. Make sure you eat well (difficult if you and your child are in hospital), limit alcohol, don't smoke and keep yourself well-hydrated. When it comes to eating, keep handy ingredients that make easy, nutritious meals such as baking potatoes, which go with so many different fillings. Tinned tomatoes can make fast pasta sauces and a slow cooker can provide a home-cooked meal at the end of a busy day. Search online for recipes. Join an online support community. There are many closed Facebook groups for various conditions and you can also try looking at an international community for rare diseases such as RareConnect. If they don't have a community for your condition and you are part of a patient group, you can even ask to start one for free. They also have Discussion Topics outside of specific disease communities where you can ask questions about any aspect of rare disease. Even if your child has no diagnosis, there is now support from SWAN UK and SWAN US for Syndromes Without a Name. RareConnect is also starting an international, multi-lingual community for undiagnosed conditions. Become an activist. When you are ready, you'll find there are so many ways that you can make a difference and feel empowered. These include joining your local surgery's Patient Participating Group, becoming a volunteer with you support charity, or, if there isn't already a patient group for your condition, think about starting one. Genetic Alliance UK has a service that can help people start patient groups using the lessons learned from many others who've done the same thing. So many charities and support groups started on someone's kitchen table - why not yours? If you have a good specialist you will often find that they would be only too happy to support you in this. Patients are now even being involved in research for their little-known conditions. Becoming an advocate or volunteer can also give you confidence and new skills. Remember who you and your child are. You may feel changed by the diagnosis; saddened, relieved, depressed, anxious, or more determined than ever to find solutions. Maybe all of those! Your child, however, is the same person today as they were the day before the diagnosis. A diagnosis is a gateway to appropriate services, it says nothing about who your child is or who you are. Whatever this rare disease journey throws at you, remember you are not alone and help is out there and I hope this gives you some ideas of how to find it. If you have some great tips of your own, please add them below in the comments. Birmingham Children’s Hospital puts the fun in fundraising in its fabulous Rare Disease Day event! Life Skills – are children with VI missing out?